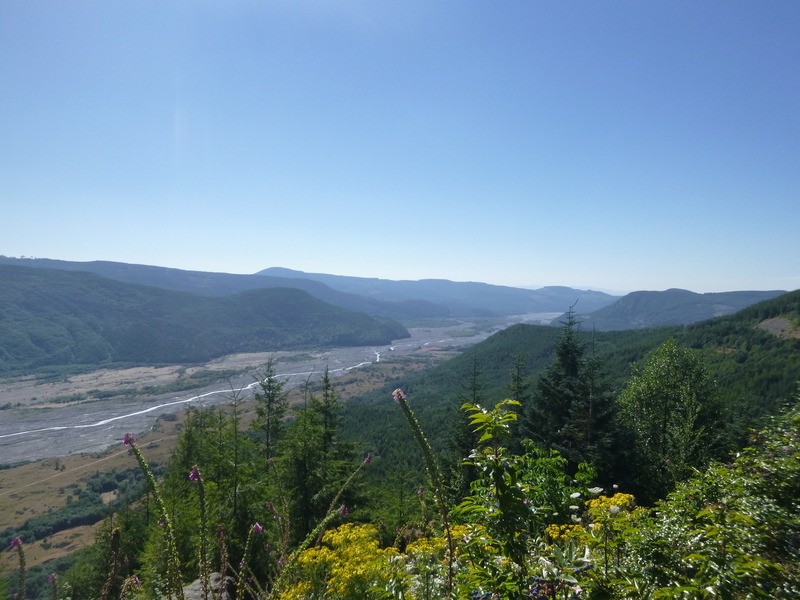 Mount St. Helens National Monument showcases the aftermath of the devastating 1980 eruption, inviting visitors to explore the various changes to the landscape. 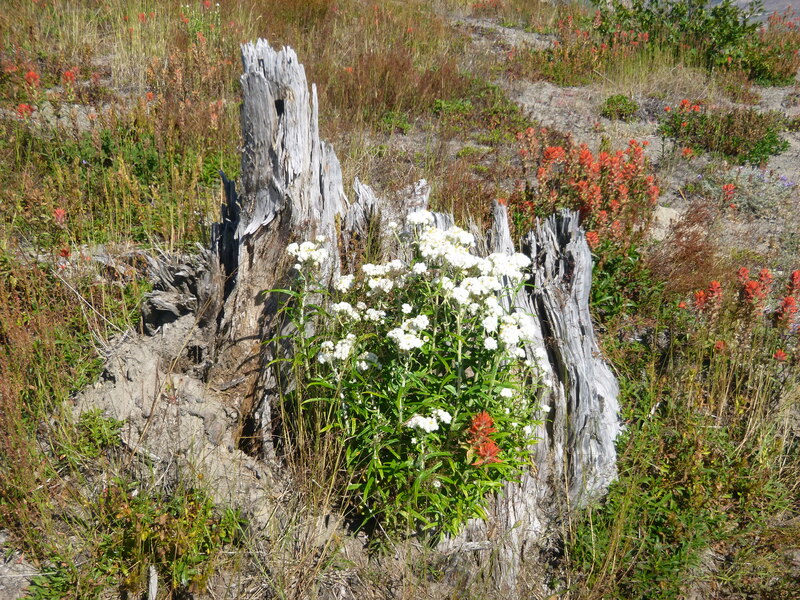 Far from being completely surrounded by barren lava fields, Mount St. Helens is in fact encircled by solidified lava flows, rock slides and mudslides, young plant life, ash, and brush in addition to untouched forest. 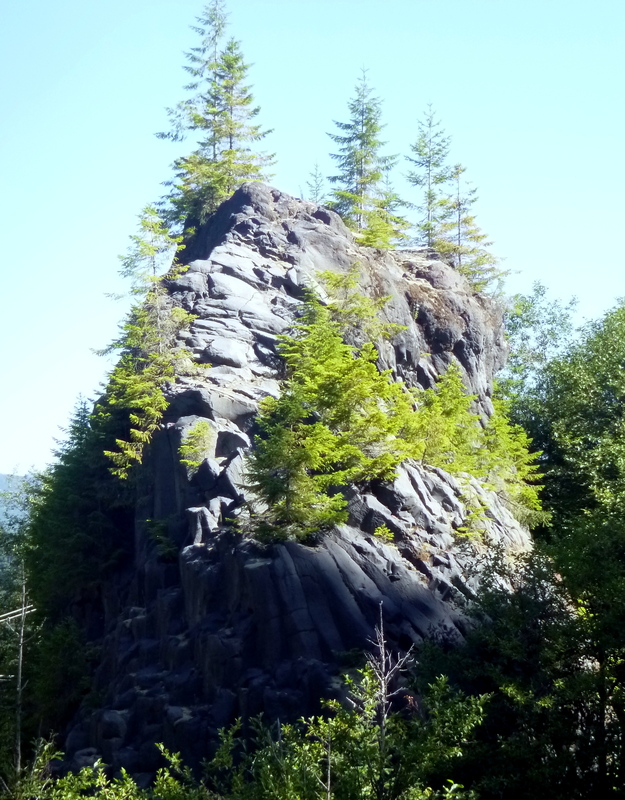 The Lahar region to the south is largely new growth that’s taken root on the slurry of hardened mud, rock, and ash that barreled down the mountain in May 1980. 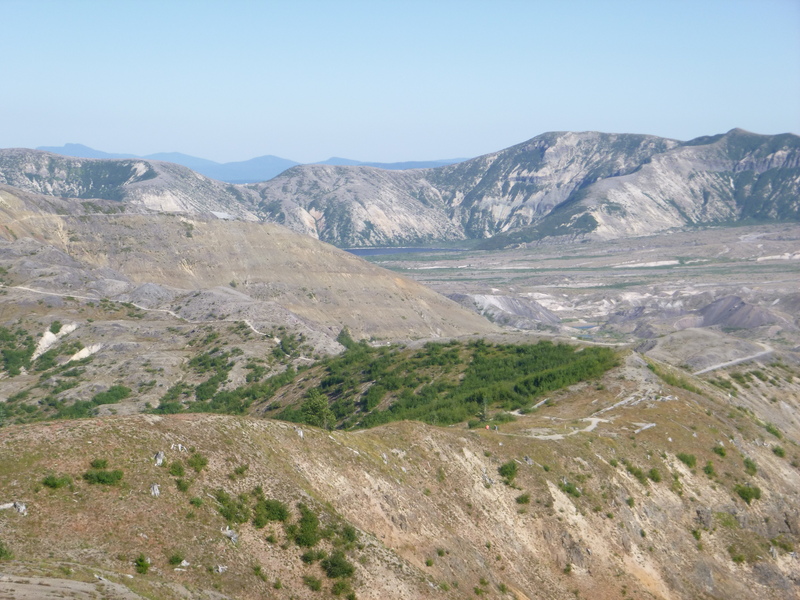 Propelled by the instantly-melted glaciers, the deposited pumice, mud, and other material filled this area, relegating life to the outer edges of the valley where it has only recently started creeping back in. 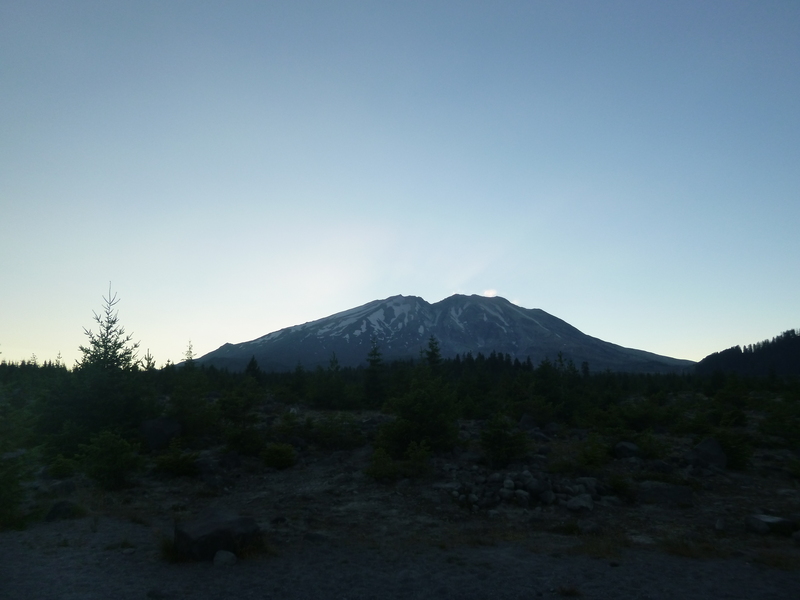 View of the volcano near sunset from Lahar area on southeast side. Note the scrub brush and young conifers that have only recently began repopulating this area. 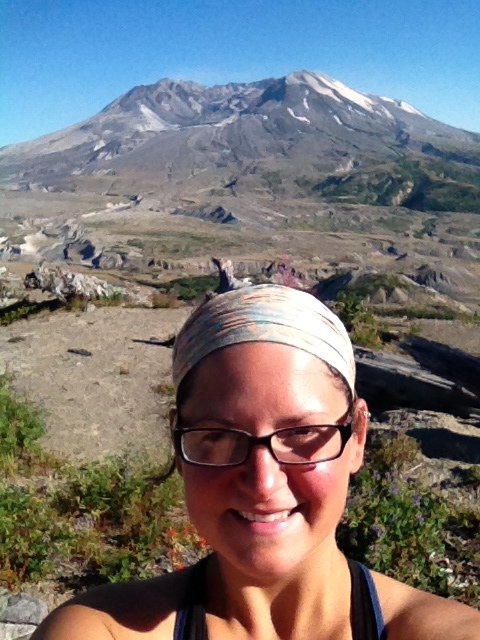 Mount St. Helens National Monument, WA. 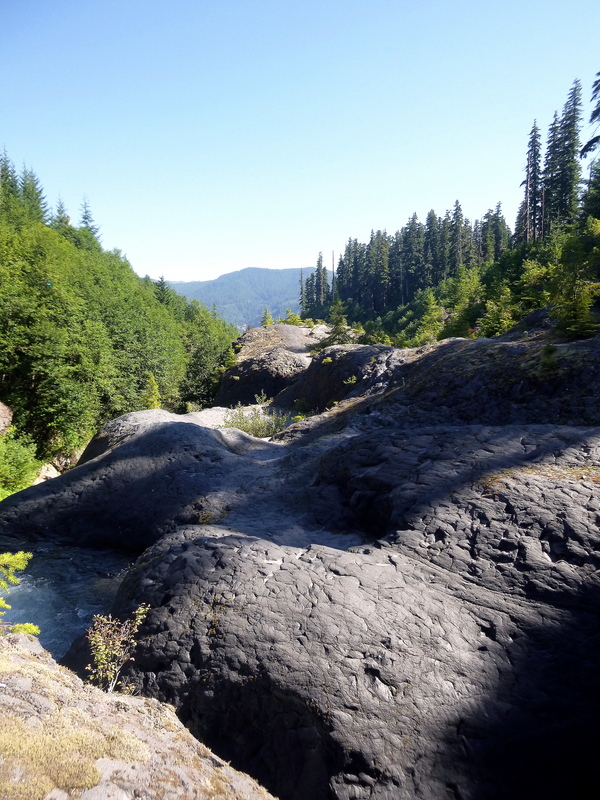 That same mudflow wiped out an adjacent section of mature forest, exposing a long-buried canyon of lava that was deposited by a 2,500 year old eruption. 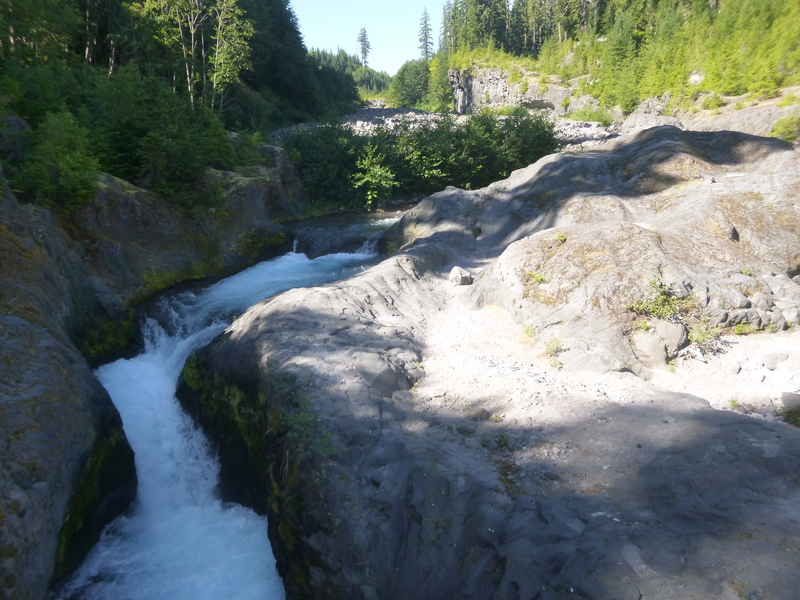 Today, Lava Canyon is again visible and shows the sculpting effects of rushing water. 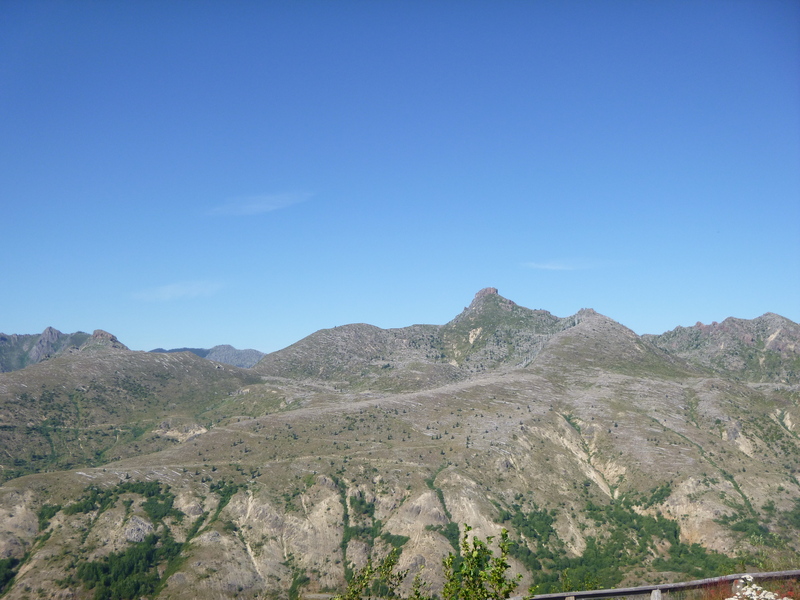 The “blast zone” – where laterally directed force of super-heated steam and fragments burst from the cone during the eruption – is largely to the north of the volcano and impacted the landscape in an entirely different way. On this side, the eruption disintegrated the north face of the volcano, permanently changing its form, while crumpling the mature forest with intense heat before burying it under tons of ash and/or lava and mudflows. Much of the land north of the volcano that was in the blast zone is still reminiscent of the lunar surface – a wasteland of solidified mud and lava that came from the where the pressurized magma broke free of the mountain. 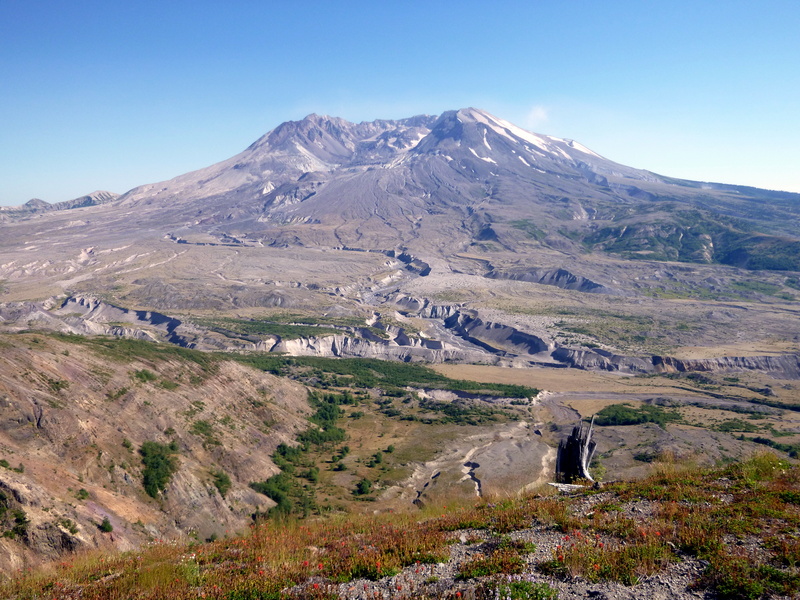 As a long-active volcano, Mount St. Helens has nonetheless only had one eruption is which it spewed the red, fast-flowing, fluid lava more commonly seen in places like Hawaii. 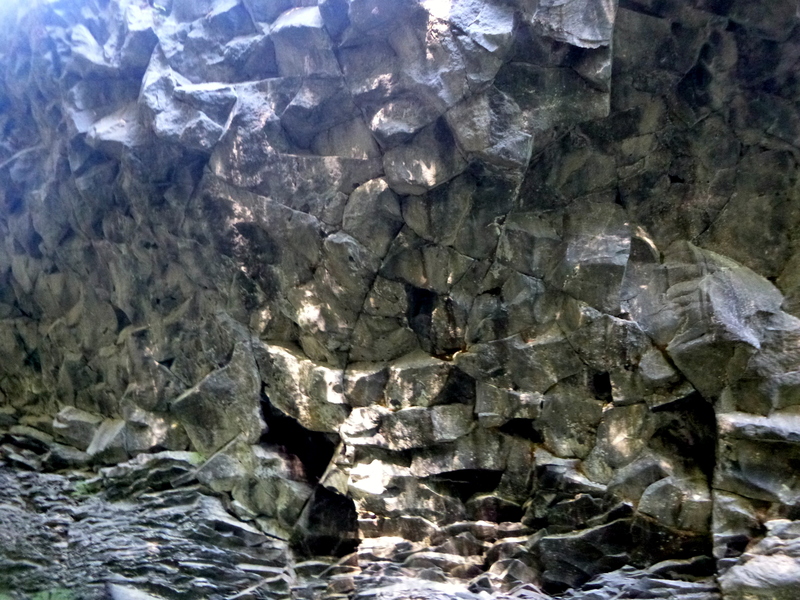 This event, which occurred about 1,900 years ago, created an uncommon formation known as a lava tube, known today as Ape Cave. As the fluid lava flowed quickly down an existing stream bed on the southwest side of the volcano, the top layer cooled and hardened which insulated the flowing lava underneath, enabling it to remain hot enough to melt existing rock and viscous enough to carry away the debris. 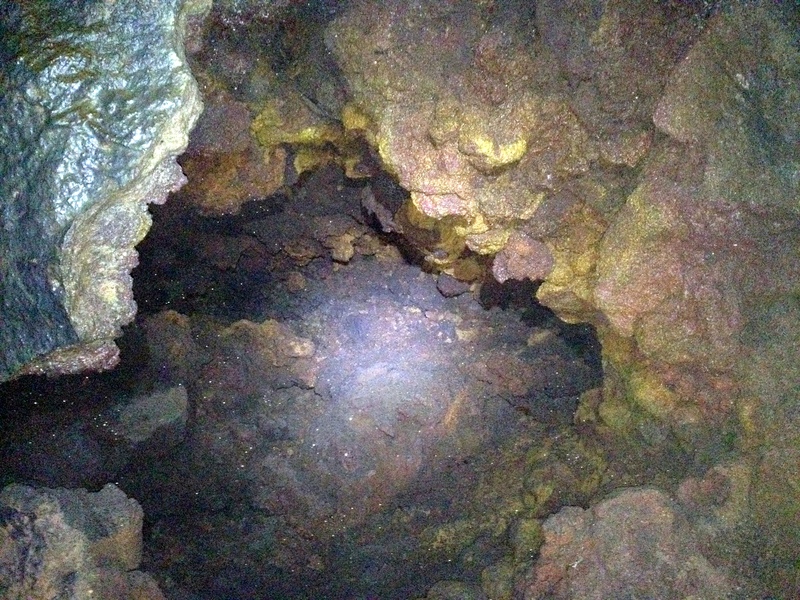 When the lava eventually stopped flowing – which may have been up to a year later – it left a large empty chamber or cave that stretches over 13,000 feet (or 2 ½ miles). 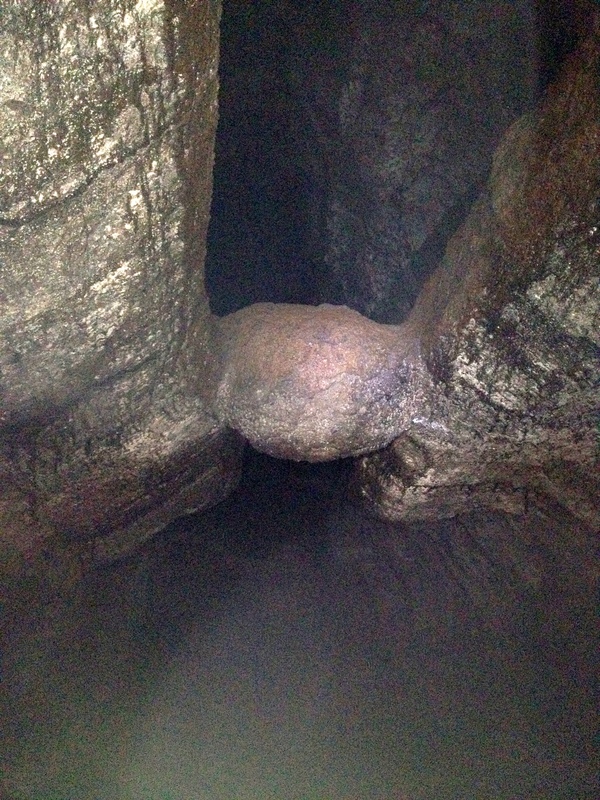 Within the cave there are a variety of interesting shapes caused by differing types of flows but the most famous feature is The Meatball, a round piece of lava seemingly suspended that became wedged in between a narrow section of the cave. Unfortunately the flash would not work properly on my camera so the following pictures were taken with my phone.